Flowers and flower bouquets have their own language. We all know that a dozen of red roses is related to love and actually means “Be Mine”, but did you know that Coreopsis means “Love at first Sight” and 3 roses means “I love you”? 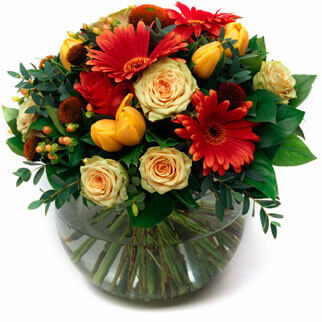 By ordering flowers for delivery you can deliver all your thoughts without saying a word. How about sending 50 just to show your unconditional love or order 10 roses to your wife to tell her that she is perfect or deliver a Hyacinth which means “I’m sorry, please forgive me” (my favorite). The process of ordering the flowers online is really easy. Go to your favorite online flower shop. There are hundreds out there and a google search will get you started. I have visited about 15 flower websites and checked their prices and they seem to be pretty much on the same level. I usually look around for coupons before ordering the flowers and can typically save around $10-20 on a single order of flowers. Most of the flower stores work together in delivery network and will get your flowers delivered no matter where you want them delivered and no matter where you are located when you order the flowers. Many of these stores also offer same day flower delivery and if you sign up for their email service they will notify you with their specials when special days and holidays like mother’s day, fathers day, valentines day Christmas and thanks giving comes up. The Rose is the flower whose meaning we most understand, but here are some details of the meaning of the Rose that may be of further interest. ← Spinning Rims – What’s The Deal?